Dragonflies are a relatively easy insect group to get to know and the equipment required is minimal. A good field guide is essential such as Britain’s Dragonflies (Smallshire & Swash, 2014) and a good pair of binoculars are a real asset. Some extremely close focusing models enable you to view sharp easily identifiable images whilst standing as close as 0.5m from the dragonfly in question. This allows you to enjoy some truly stunning close up viewing and on a practical note often negates any need for netting. If searching for exuviae then a pair of wellies or waders can prove useful as well as numerous small plastic pots to protect you fragile finds. If looking for larvae the equipment required is more specific and is well explained in the Field Guide to the larvae and exuviae of British Dragonflies: Damselflies (Zygoptera) and Dragonflies (Anisoptera) (Cham, 2012). Whichever stage of the life cycle you are observing don’t forget a notebook for all your species records! In Shropshire there are only a few dragonflies that require close up examination in the hand for identification purposes. For this a x10 hand lens will be sufficient. To catch such specimens a round framed soft mesh net should be swept up and under from behind the insect to reduce the chance of any damage to the head area. 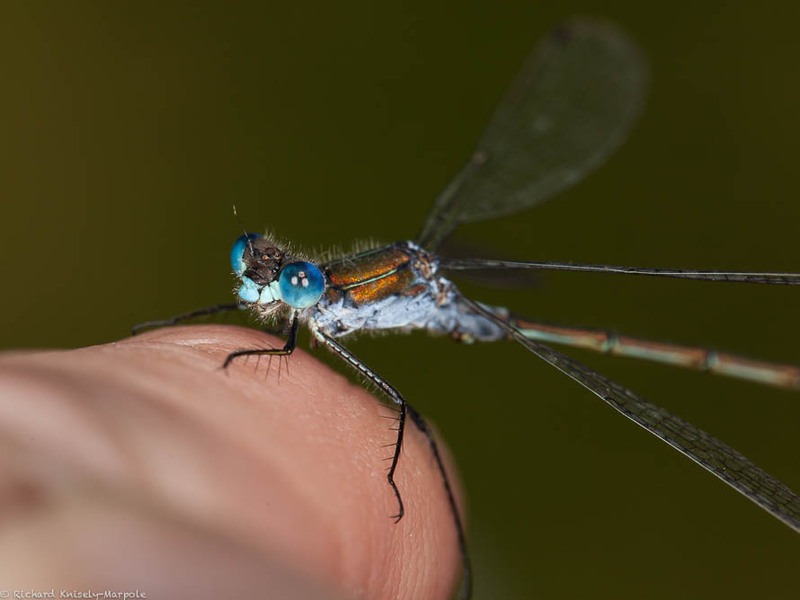 Great care must be taken not to damage the insect and it is best to attend a field course or seek advice with regards to the correct handling of dragonflies and damselflies. Advice on netting can be found via this link to the British Dragonfly Society Code of Practice on collecting Dragonflies. This document also outlines the very rare circumstances in which the permanent collection of specimens is acceptable. This is not necessary for identification of Dragonfly specimens in Shropshire and with excellent close focus cameras now widely available the few difficult species can be briefly held and examined and the photographs sent for identification never the insect! It is also worth noting that certain species elsewhere in the UK such as the Norfolk Hawker are legally protected and as such require a licence for netting and handling. Cham, S. (2012) Field Guide to the larvae and exuviae of British Dragonflies: Damselflies (Zygoptera) and Dragonflies (Anisoptera). Peterborough: The British Dragonfly Society. Smallshire, D. and Swash, A. (2014) Britain’s Dragonflies. A field guide to the damselflies and dragonflies of Britain and Ireland. 3rd ed. Oxfordshire: Princeton University Press. Close up view of an Emerald Damselfly.